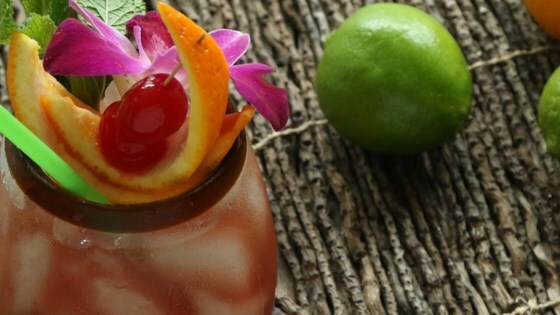 "When it's late and you're hanging around the fire pit with friends watching the sunset, this is the rum punch crowd-pleaser to pass around. Full of bright citrus, floral notes and plenty of good rum, you'll all have a delicious time before the day is done." Combine crushed ice, spiced rum, lime juice, orange juice, grapefruit juice, white rum, dark rum, hibiscus syrup, and almond syrup in a cocktail shaker. Cover and shake until the outside of the shaker has frosted. Fill a tiki mug with crushed ice. Strain cocktail over ice. Garnish with orange slice and maraschino cherry. To make hibiscus syrup: Bring 2 cups water, 1/2 cup white sugar, 1/3 cup hibiscus flowers, 1/4 cup brown sugar, a 1/2-inch piece of fresh ginger, and the zest of 1 lemon to a boil in a small saucepan. Reduce heat and simmer until sugars dissolve, about 10 minutes. Remove from heat and let mixture steep, about 5 minutes. Strain through a fine-mesh strainer, pressing mixture to extract as much liquid as possible. Discard solids and store syrup in the refrigerator for up to 2 weeks. Way too tangy from the lime juice, I didn't enjoy this at all.